Stock photo of the Peak 2 Peak Gondola on Whistler Mountain with Blackcomb Mountain in the background, Whistler Blackcomb, Whistler, British Columbia, Canada. This stock photo shows the Peak 2 Peak Gondola on Whistler Mountain with Blackcomb Mountain (2440 metres/8000 feet) in the background, Whistler Blackcomb, Whistler, British Columbia, Canada. 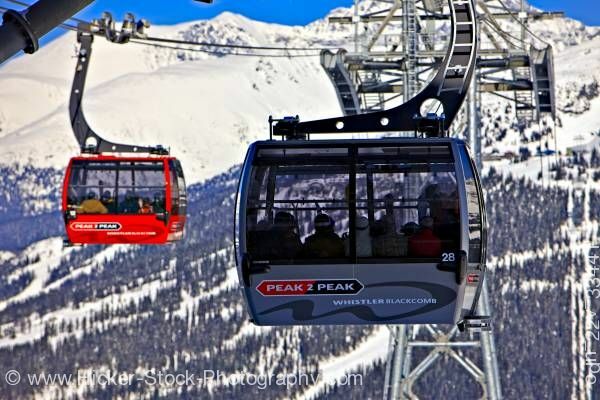 The record-breaking new PEAK 2 PEAK Gondola links together Blackcomb and Whistler Mountains for the first time. Boasting the longest unsupported lift span in the world at 3.024 kilometres (1.88 miles), it’s also the highest lift of its kind at 435 metres / 1,427 feet. Whistler-Blackcomb has touted the gondola as an iconic attraction and uses it to transport skiers in the winter months as well as sightseers in the summer months.